I have long been interested in sperm storage in a variety of species, a technique that allows female animals to separate mating and gestation. There is evidence for sperm storage in animals ranging from insects to mammals. This can be advantageous to females in a number of situations, for example when sexes are segregated and potential mates are encountered only sporadically. Female animals can then use stored sperm from a single mating event to fertilize multiple rounds of offspring. It might also be useful when mating occurs at a time that is not ideal for fetal development, or in mammals for raising young. For example when environmental conditions are severe and/or resources are scarce. Sperm storage mechanisms may also allow for sperm selection, when a female mates with multiple males, but selects to fertilize her eggs with only the sperm of that male (or males) she prefers. In my own research field, this topic has become of interest in the whale shark. We showed a few years ago that a single female whale shark carried embryos whose ages varied by perhaps many months, but yet all embryos were fathered by a single male. Because male and female sharks do not form stable breeding pairs, this data suggested that whale sharks are capable of storing sperm, and fertilizing their own eggs over a long period of time. Little is known about the habitat or movements of adult whale sharks. If males and females are segregated as researchers suspect, sperm storage would allow female whale sharks a great deal of reproductive freedom whether or not they encounter a male. 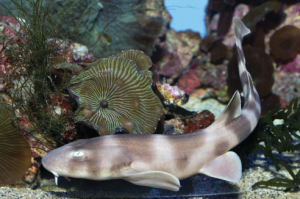 Recently, Bernal et al reported a brownbanded bamboo shark (Chiloscyllium punctatum) pup that was born at the California Academy of Sciences from an egg laid by a female that had been isolated from males for at least 45 months. The authors considered that the pup could also have resulted from parthenogenesis, a type of female-only reproduction where an egg duplicates its single set of chromosomes to become diploid, and carries out normal embryonic development. Parthenogenesis has been documented in a number of shark and ray species over the last several years. Parthenogenesis generates offspring that have only genetic markers derived from the female, however, and can be distinguished from sperm storage by the presence of non-maternal markers. Bernal et al show that the bamboo shark pup had unique markers that could have been derived only from fertilization by a male. The authors note that sperm storage for up to 7 months has been noted previously in brownbanded bamboo sharks. Successful fertilization after nearly 4 years of sperm storage, however, is the longest period documented in any species of shark. The authors finish their article with the suggestion that long-term sperm storage may provide a bit of a reproductive buffer, should shark species continue to decline. Figure from Bernal et al.